Gov. 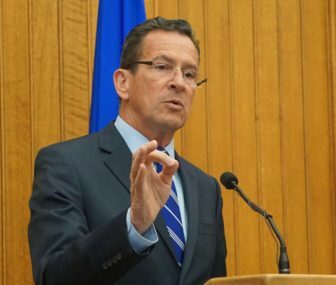 Dannel P. Malloy effectively told Republican legislative leaders Thursday to put up or shut up when it comes to the next state budget. Republicans in the Senate and House have spent the past two days blasting a Democratic proposal to give cities and towns extra time to adopt local budgets — given that legislators here are struggling to find ways to balance Connecticut’s finances for the next two fiscal years. Len Fasano and Themis Klarides, GOP leaders in the Senate and House, respectively, said the best way to clarify the municipal aid picture is to get the next state budget adopted well before the legislature’s June 7 adjournment deadline. The Republicans suggested in a recent letter to Malloy that a new budget could be adopted by May 5 — one week after the legislature’s Appropriations Committee and Finance, Revenue and Bonding Committee finish their work. The Democratic governor’s response: Well then can we see the Republicans’ budget proposal now? “House Republican members and staff are fully engaged in the budget process,” Klarides responded to Malloy through a press release. “As your budget winds its way through the committees we expect to offer alternatives to the tax and spending plans as they were presented just one month ago. “Presumably, the administration used its considerable resources all last fall and into this winter to come up with the” biennial budget it presented on Feb. 8 to the legislature. “Thank you for your obviously politically charged and partisan letter today,” Fasano wrote in his response to Malloy. The Senate Republican leader noted that the governor and the legislature adopted a state budget by May 4 in 2011 — Malloy’s first year in office — so a May 5 target for adoption this year is reasonable. Senate and House GOP leaders Len Fasano and Themis Klarides. Republicans traditionally unveil their plan in late April to coincide with the deadlines of the legislature’s budget-writing committees. Fasano and Klarides, who rose to the top spots in their respective caucuses starting with the 2015 session, have continued that trend. The GOP unveiled their last two proposals on April 25 in 2016 and on April 24 in 2015. The upcoming two-year budget cycle is particularly difficult because of surging pension and other retirement benefit costs, which are expected to continue rising significantly over the next 15 years because of decades of inadequate funding. State finances, unless adjusted, will run $3 billion in deficit over the next two fiscal years combined, according to the legislature’s nonpartisan Office of Fiscal Analysis. The Malloy administration pegs the potential shortfall at $3.6 billion. And ending the real estate property tax exemption for nonprofit hospitals.